Every day is a great day to catch a band or musical group you love. From jazz to pop to classical, we hope you find something in this list that captivates you. 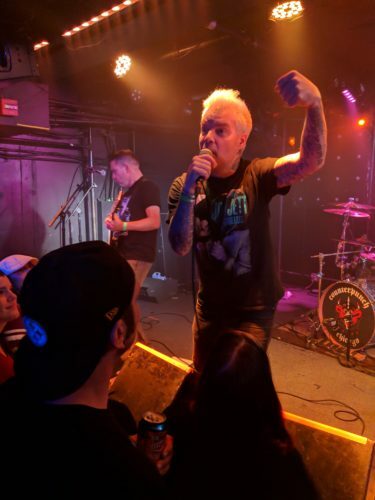 I recently caught Santa Cruz, California-based punk band Good Riddance at Rock and Roll Hotel. Their set was tight: Watching them was rowdy, clean, tinnitus-inducing fun. The band’s energy was excellent, radiating from the stage and drawing die-hards and casual listeners in, side by side. Living on the Hill, it’s easy to take our local music venues for granted, but a Sunday night show at R&R was a ton of fun. If you like punk –especially with a bold message– check Good Riddance out: They are back on tour after a long hiatus. What’s playing around our local venues, you ask? 12/1/18: Electric Heart * Fix Your Hearts * Casual War, 8 p.m.
12/2/18: The Walkaways//American Opera//Roof Beams, 8 p.m.
12/6/18: The Very Small with Technicians and Honey Kill, 8 p.m.
12/7/18: The Coffin Daggers//Atomic Mosquitos//The Bali Lamas, 8 p.m.
12/8/18: Black Dog Prowl // Shagwuf // Heavy Wire 8:30 p.m.
12/11/18: Gina Sobel & Cecily, 7 p.m.
11/30/18: Surprise Attack, 9 p.m.
12/1/18: Endless Winter, 9 p.m.
12/2/18: Peter Bjorn and John, 8 p.m.
12/3/18: Eric Rachmany , 8 p.m.
12/6/18: The Ballroom Thieves , 8 p.m.
12/7/18: Amber Run , 8 p.m.
12/8/18: Schmalls Fest , 7:30 p.m.
12/11/18: CAAMP , 8 p.m.
FRI 11/30: An Evening with The Subdudes, a New Orleans blend of blues, gospel, funk, and R&B. SAT 12/1: Iconic singer songwriter Livingston Taylor with a career spanning 50 years will performs a matinee show. Have you heard of Groupmuse? This website tells you where there will be classical concerts in living rooms near you. Check it out!